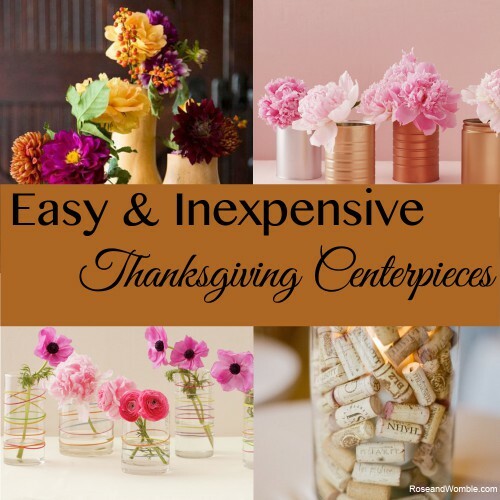 Easy and Inexpensive Centerpieces for Your Thanksgiving Table - Rose & Womble Realty Co.
Having a beautifully decorated table doesn’t require a lot of money or skill – instead just rely on these good ideas. In just a few weeks many Americans will gather around the table to celebrate Thanksgiving. And many hosts and hostesses are already busy planning the menu and even the decor. There is the traditional cornucopia filled with seasonal foliage, or a beautiful arrangement of mums and candles – but if you go through a florist those can get a bit pricey. So why not go through your house and uncover what you can come up with on your own? We gathered some awesome ideas from all over the internet, but we have even more on our Thanksgiving Centerpieces Pinterest board. How simple could you get? Keep a few of the cans from your kitchen prep – spend an hour painting them and then set out with seasonal flowers and berries. While these show peonies you can easily adapt this for the fall and even winter months. Also, don’t limit yourself to small cans – break out coffee, larger cans, or even mix in some mason jars. Easiest project ever! Take plain water glasses and put a few colorful rubber bands around – fill with candles, flowers, or vase filler. The easiest vase you’ll ever make. Take water glasses and find some colorful rubber bands. Use one of the most popular items in the supermarket to create one-of-a-kind look for your table. You cut enough out to put in florist tubes (available at any craft store) – an organic and lovely bud vase. Unexpectedly lovely – these gourd vases are a lovely touch to the Thanksgiving table. These is that technique where you take one large glass cylinder and then add a small one – then you fill the gab between the two with something interesting. For fall it could be leaves, acorns, or wine corks. Find the directions here. Great excuse to uncork a few more bottles – as if you needed an excuse!